It can be very confusing and frustrating when companion cats who have previously lived together in harmony, suddenly decide to engage in a turf war. 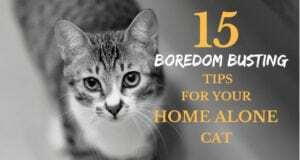 In some cases, the cats have lived under one roof with an ongoing degree of tension that has now turned to outright hostility and aggression. Cat parents become understandably upset when watching their feline family turn the living room into a battlefield. 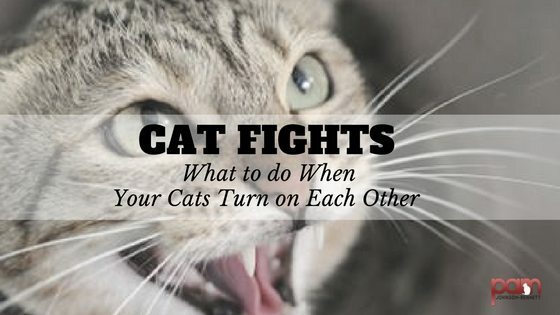 I’ve found in my consultations that many cat parents don’t always recognize the fact that their cats aren’t getting along with each other because there are no overt signs of aggression. The cats might not be engaging in an outright battle with fur flying and bloodshed so some cat parents miss the subtle signs of tension. Keep in mind that cats generally prefer to not engage in an actual physical confrontation and that’s why they go to elaborate attempts at posturing. Each cat is hoping that his puffed-up “I’m a really bad dude so don’t mess with me” posture will convince his opponent to back off. There can also be some intimidation going on that’s just under the radar where one cat engages in behavior such as guarding the path to the litter box or nosing another cat out of the food bowl. Not all companion cats are going to get along 100% of the time; just as with people, there are bound to be some misunderstandings and miscommunication, but if you notice a pattern of intimidation, there may be more stress between your cats than you originally thought. Then there are the cases where there’s no mistaking the fact that your cats don’t get along in any way. Growling, hissing and physical brawls may have become a part of daily life in your household. If this is the case, don’t wait it out with the hope that the cats will eventually reach an understanding. This level of aggression will only get worse. In order to correct the aggression between your cats you have to find out what’s causing it. If the aggression is sudden and uncharacteristic then there could be an underlying medical cause. Any time there’s a change in behavior your cat should be examined by the veterinarian in order to rule out possible medical causes. One cat might be experiencing pain or has developed arthritis and that may be causing the aggression toward the other cat. Visiting your veterinarian is an important step that shouldn’t be skipped. Next: Is Your Cat Stressed Out?